I know, peplum tops have been around for a while now, but I’m a little slow to pick up on trends, so this is my first attempt at making one. 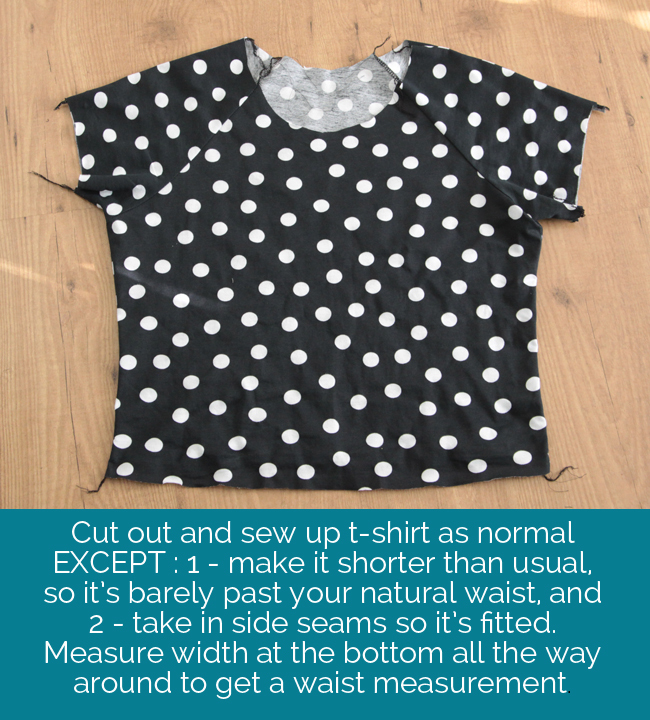 Turns out it’s not hard at all, especially if you already have a t-shirt pattern you like. 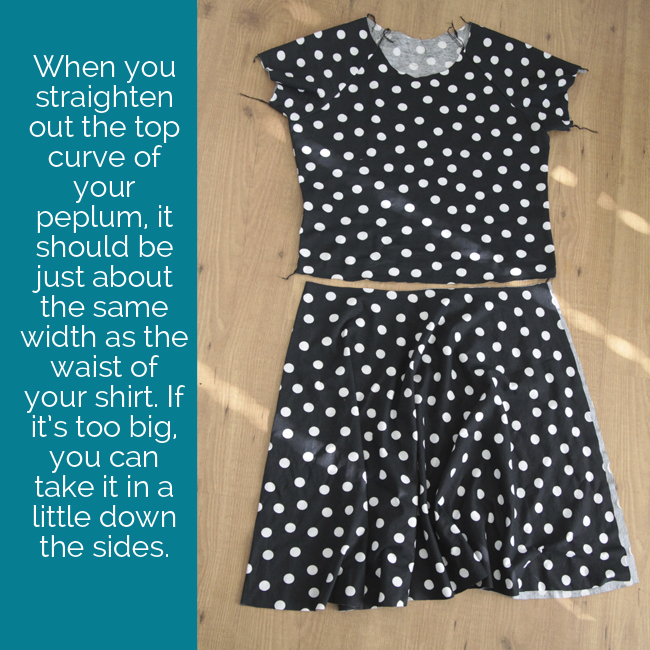 If not, you can trace a shirt that fits well to make your own pattern for the top of the shirt – then the peplum is really just a half circle skirt added on. Keep reading for step-by-step instructions and photos. This is much more flattering on me because instead of adding extra fabric at my waistline like a gathered peplum, it creates the illusion of an hourglass figure. This type of peplum is a little more complicated than a gathered peplum, and it’s what I’m going to show you how to do today. If you have to read that more than once, don’t feel bad. Half circle skirts (which is what this peplum is) are a little hard to wrap your head around, but once you give it a try it makes more sense. Oh, and I was originally planning to make this a dress, not a top, which is why the peplum looks so long in the photo above. 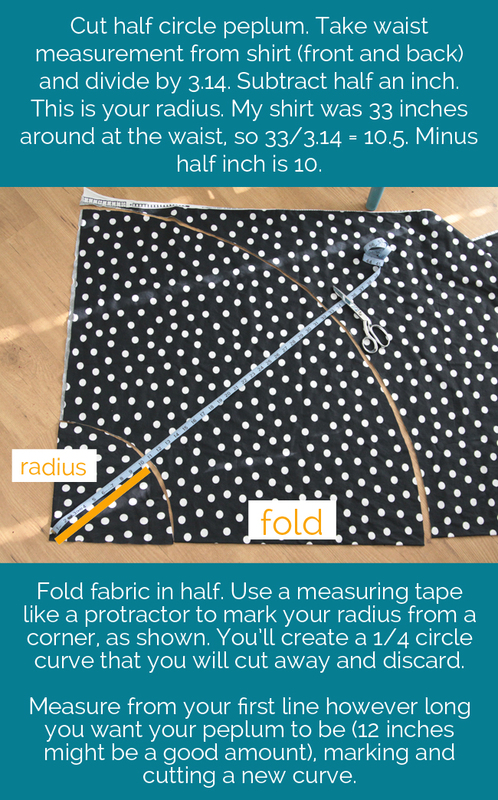 Depending on how stretchy your fabric is, the skirt might be bigger around the waist than the shirt is. No problem, just sew down the side seams to take it in. If it’s too small, just trim 1/4-1/2 inch off the top (the inside curve of your donut) to make it a little bigger. This is what your shirt will look like once it’s put together. When I first sewed mine up, I didn’t like it much. I realized I needed the waist (where the shirt and peplum meet) to be a little bit higher. So I unpicked it, cut another inch or two off the shirt, and sewed it back together. I also took it in a little more along the side seams. Then it’s just a matter of finishing the neckline and sleeves (as usual), and giving it a hem. Very narrow hems are easiest on peplums like this one. And that’s it! A trendy new top for about $7.50. 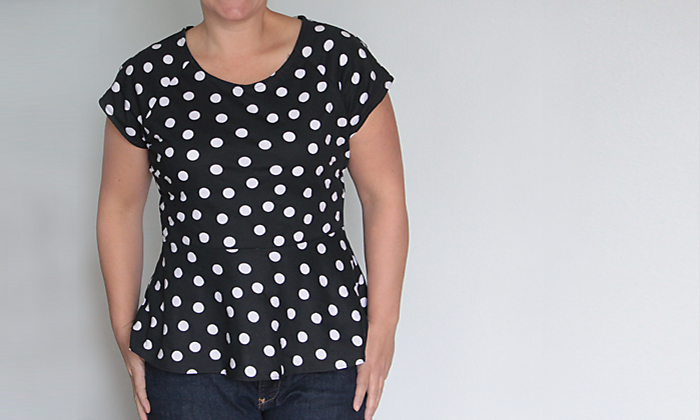 I used this fabric from Girl Charlee and I think it’s PERFECT for a peplum shirt. It stretches, but it’s a lot stiffer than many knits, which gives the peplum a little body and allows the shirt to be more fitted without being clingy. 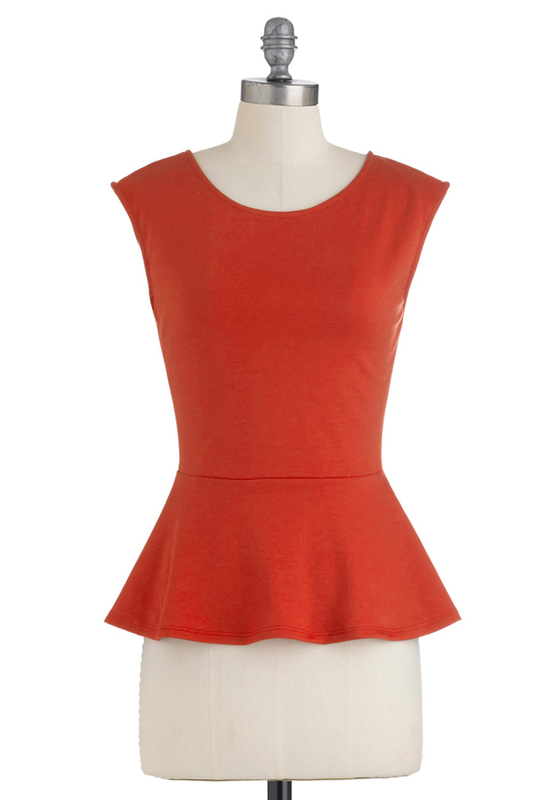 A softer knit will give a drapier peplum – check out an example of that in this post. I love the longer peplum; it hides more tummy. I have seen several re-dos of a shirt that are just too short ; and they are gathered. YUK! I adore your peplum top! Thank you so much for the great tutorials and Basic Tee pattern variations. I have them all Pinned to make up as I have time. I like your style and appreciate you sharing your knowledge & tutorials. Thank you and keep up the great work! Hi Autumn! What a great tutorial and love the top. I really appreciate you shopping with us at Girl Charlee and mentioning us in your post. Keep on Sewing!! always interested in sewing tips now I am retired I do more clothes sewing and I love it . Always interested in sewing tips as I am retired now and do more clothes sewing I love it . Thanks for the great ideas and tutorials, you make it look so easy! Well here goes I plan to give it a try. Thank you for this method. 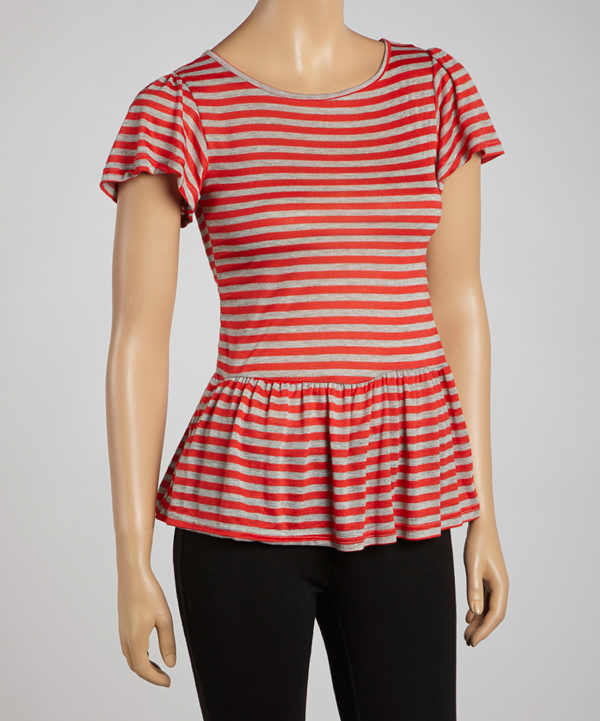 There’s another application of peplum as a curved seam that makes a flattering lower edge. Have kept it in my someday file. It is just for the lower back of a suit jacket. Would be ideal to frame a different fabric such as lace for the upper back. The flare width covers the slight weight gains of traveling etc. I love the idea of lace for the upper back with a peplum! Sounds gorgeous. wow this the perfect peplum style for my negligible waistline. and looks cute! thank you for sharing. You’re welcome! My waistline is quite negligible as well (great way to put it) and I love how this style looks. I love the pattern, thank you so much for such great tutorial. I got to make one, just love it. I love the way you showed and explained every step of this pattern! I am definitely going to give it a try!!!! Thank you. I have always beena bit scared of tops, but seeing all the things I can do from one basic pattern is giving me so much hope! I’ve thinking that this with long sleeves would be a lovely autumn/winter top for the office, and what do you know, you have a tutorial for adding long sleeves! Thank you soo much for making it so easy!! This is a great tutorial! Thank you. My question is what type of fabric did you use? The link you included is no longer available. Lovely idea, very kind of you to offer this for free. First, let me say that you have some phenomenal tutorials. So clearly stated and easy to use! I had already made a dress, using a remodeled t shirt and a piece of fabric I had bought. I didn’t like the way it turned out because of my thick waist. So I decided to add this peplum, after everything else was all put together. It was so bulky and hard to handle on the machine! 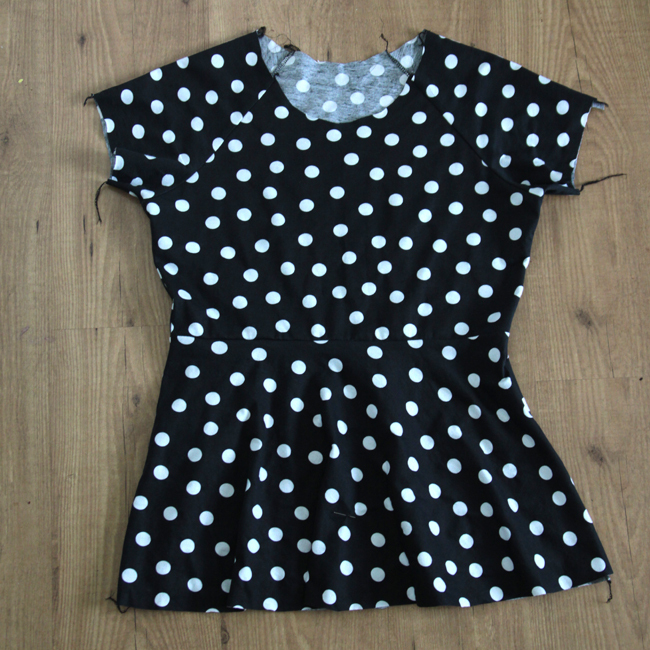 I had to sew pieces of a black t shirt together to have enough to cut the half-circle properly, so I came out with these slanted seams on the peplum. Then, as I was sewing the peplum to the original t shirt top (I placed it a bit higher than the waistband) I found that I had to let it gather in places that I hadn’t planned. But – in for a penny/ in for a pound – I just kept sewing that seam. By a happy and serendipitous occurrence the gathers came out at some strategic places, coordinating with the slanted seams and I got an accidental great design. Thanks for sharing your discoveries with us. Thank you for a honest, staight forward and easy tutorial. I was definitely inspired to try making mine. 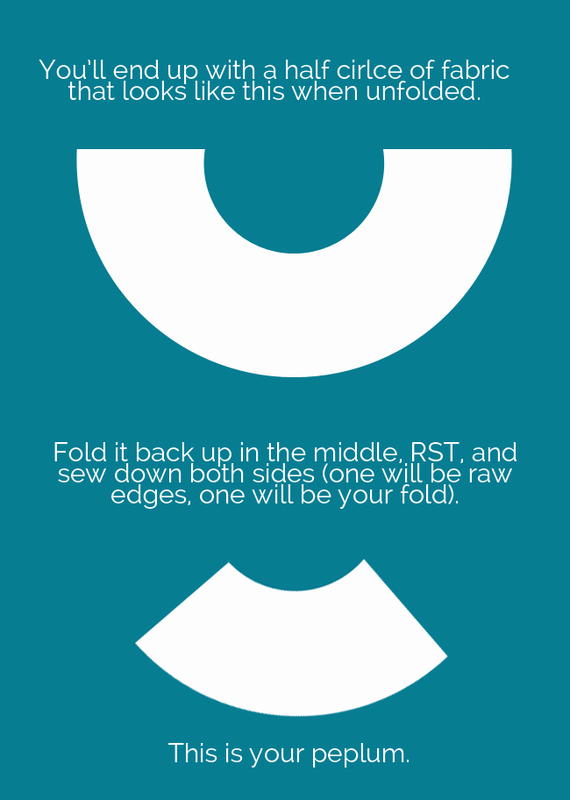 I found this really helpful for a top i was sewing. Thank you so much! I am going to try that today! thanks for this great lesson. Thank you for the great tutorials! I just refashioned an old jersey shirt I bought (but never wore) from H&M. I took some knit from my stash and used it for the bottom portion of the peplum and it looks great! I think this will become one of my go-to shirts when I want to dress my jeans up a bit. I’m so happy I found this post! Thanks for all the details and explaining the 2 types – I never would have thought about it…. I’ll definitely be giving this a try! I am short, my waist is wide and my hips flat so I find even the half circle peplum adds too much flare to sit right on me. I find cutting a straight skirt off at hip level, folding out the darts, then opening small wedge from waist to hem edge gives me just enough flare in a peplum.